Darwin, Charles, in The variation of animals and plants under domestication.. (1868 ),p322.
" Here is a more curious case: white cats, if they have blue eyes, are almost always deaf......"
" This case of correlation in cats has struck many persons as marvellous. 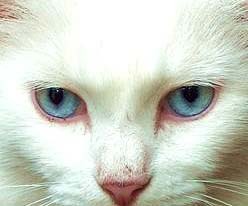 There is nothing unusual in the relation between blue eyes and white fur; and we have already seen that the organs of sight and hearing are often simultaneously affected. In the present instance the cause probably lies in a slight arrest of development in the nervous system in connection with the sense-organs......."
Arguably, the first direct suggestion that redox processes are involved in cell signaling is the Adrenochrome Hypothesis of Hoffer and Osmond. This states that psychoactive oxidative products of catecholamines (adrenochromes) play a role in schizophrenia and other neuropsychiatric diseases. While the proposed mechanism is long-suplanted, the fundamental concept that messenger-mediated oxidative stress is involved in neuropsychiatric disease has proven correct. Similarly, in a feed-foreward process, redox-signaling-mediated cell growth and proliferation combine with genomic instability and Darwinian selection to drive many cancers. "Role of Active Oxygen Species in Ocular and Neurological Diseases"
"As should be clear from this symposium, active oxygen species may play a key role in a large variety of physiological processes including certain neurological syndromes, inflammation, coagulation, scarring, drug toxicity, and so forth. While free radical chemistry has long been perceived to have relevance to biology, a key objection to assigning a role for electronically-active species in processes such as those listed has been that these processes occur by very organized and specific mechanisms. Thus, it is difficult to build models to explain the apparent role of active oxygen species in such mechanistically-complicated process based simply upon the chemical reactivity of such species. Likewise, even evoking such things as the Haber-Weiss reaction, the chemical reactivity of active oxygen species does not correspond to their biological activity. Examples of this are the apparent role of peroxide (rather than superoxide ) in OHP-induced convulsions, antitumor agent toxicity, and acute burn-induced plasma volume loss. Likewise, processes such as granulocyte lysosome release seem to be dependent upon both superoxide and peroxide, others such as OHP-induced convulsions only upon peroxide, and still others (e.g., platelet activation ) upon superoxide alone....One explanation for this data is that various active oxygen species ( or such products as hydroperoxides ) may act as specific transmitter substances...."
As ref 1 and the CRC review article below detail, peroxide has been known to modulate (e.g.) insulin action since at least the mid 1970's. Likewise, in a 1970 publication*, we noted the similarity of the choreoathetosis in the Lesch-Nyhan syndrome to the side-effects of levodopa (implying a role for dopaminergic processes ion this disease ) and related this to the electron-transfer properties of the purines. Similarly, in the paper above, we refer in detail to Murad et als germinal work on nitric oxide and cGMP as well as the modulatory effect of superoxide on platelet aggregation, inflammation, tumor growth (some of which we discovered), etc. However, this abstract seems to be the first explicit suggestion that reactive oxygen species (ROS) in general play a specific cellular messenger role for a broad range of processes, e.g. neurotransmission, cancer, and inflammation. If this is not correct, please let me know. The role of oxygen radicals as ubiquitus cellular messengers is now generally-accepted. There is even a journal called Antioxidants and Redox Signaling Thus, the history of this hypothesis is illustrative of how peer-review sometimes fails for novel ideas. At the time, the reviewers universally considered the idea that free radicals are messengers (now called "Redox Signaling") far too speculative, though it is now obvious. Most likely, they have since changed their minds. Not to point fingers. There are some well-established researchers, who don't credit Redox Signaling. But should it prove true, I'd like my discovery claims honored, such as they are. Unless, naturally, anybody can find anything earlier. In which case, I will readily give them credit here. No, I am not griping about a lost Nobel-- far from it. The Nobel committee took a wild swing here and not only missed our work, but the real discoverers of high-conductivity in linear-backbone organic polymers. True, we probably did report the first active organic electronic device. Since organic electronics is part of "nanotechnology", ours is also arguably the first Nanotech device. Anyway, systemic problems with the way the Nobel committee does its research makes such mistakes almost inevitable and common. We had the honor of merely being the last (but definitely not the first) to report a high conductivity organic polymer ( even a device ), before its rediscovery earned others a Nobel prize. As detailed here, the 1977 paper which won the 2000 Chemistry prize was mostly a reprise of a series of 1963 papers by some Australian workers. Ironically, unheralded in redox signaling research where it originated, our organic semiconductor device is now on the short "Smithsonian Chips" list of key discoveries in rather different fields. These are semiconductor physics and integrated chip technology. In a rather distant way, our device is the ancestor of your color cell-phone display. Other than our work, the first specific reference to Redox Signaling seems to be from Bochner et al in 1984, five years after I presented it. Again, if anybody knows different, please let me know so I can assign proper credit, as we do the Aussies. "Citation amnesia" is a scientific sin. In retrospect, I saw it because I am a pharmacologist--cellular messengers are what we "do". Likewise, I had just finished a course in pathology that made much of the fact that processes such as inflammation are tightly-controlled by specific messenger-mediated mechanisms. Thus, the fact that superoxide dismutase is antiinflammatory prima facia implies that superoxide is a cellular messenger in inflammation, a point that only recently seems to have become widely-appreciated. One key event was the accidental discovery that SOD prevents diabetic stress-induced hair loss in rodents. See this link. This discovery may seem trivial, but the hair cycle is a very specific "developmental" process and the hair follicle is an organ in miniature. E.g., unlike inflammation or ischaemic injury, direct radical-induced tissue damage is much less a confounding variable. Thus, superoxide almost certainly is a specific messenger in the hair cycle. If here, then why not elsewhere? Interestingly, the same experiment shows that oxidative stress is involved in the pathogenesis of diabetes, now well-accepted. Further, superoxide and nitric oxide are now known to have an agonist/antagonist relationship in many systems. Completing the picture, the hair-growth-stimulating agent miNOxidil seems to be a nitric oxide agonist. Go here for a discussion. However, because of such wild-eyed speculation about how "free radicals are messengers", at the last moment, this manuscript was omitted from the book coming out of this symposium, ( Pathology of Oxygen, Academic Press, 1982 ). I could not publish this work and its supporting data elsewhere while it was pending publication here. Thus, publication took over four years. Finally, so as not to draw more referee ire, our subsequent 1984 review article on Free Radicals and Human Disease (1) repeats the suggestion much more carefully. For example, referring to ROS, we note that " modulation of specific control mechanisms such as immunomodulator proteins and lymphokines, cyclic nucleotides, or prostaglandin metabolism may be of singular importance". Similarly, relative to ROS and inflammation, we state " The specificity of such effects suggests that active oxygen metabolites may be acting more as messenger substances than as non-specific chemical reagents." Concerning fibrosis-inducing drugs such as bleomycin, we further note: " The stimulation of the fibrotic response by these radical-generating agents may be a consequence of their common interaction with existing modulator mechanisms coupling production of active oxygen species by inflammatory cells with fibrocyte activation, collagen production, and wound healing..." and so forth.. Additional details are found in the references below. For our earlier (1972) review on "Electron-transfer Factors in Psychosis and Dyskinesia". go here. This paper also seems to contain the first suggestion that homocysteine pathogenesis relates to oxidative stress. Similarly, this paper suggests that uric acid-mediated oxidative stress plays a role in hyperuricemic diseases. Now, this is of great interest in (e.g.) the pathogenesis of stroke, myocardial infarction, bipolar illness, and metabolic syndrome. Most especially, this paper also implies that electronically-activated species might act as CNS messengers, e.g., by activating psychoactive proteins or by modulating neuromelanin function or by some dopaminergic process *. This is why the title is "Electron-Transfer Processes.... and not "Free Radical Processes...." I still subscribe to this general model. For our later CRC Handbook review on "Free Radicals and Human Disease", go here. 1) Proctor, P.H. and Reynolds, E.S., Free Radicals and Disease in Man, Physiol. Chem. Phys.NMR 16,(1984)175-195. Currently, I'm a practicing physician. I also have graduate degrees in pharmacology/toxicology and biophysics and did a residency in Pathology. So I have a little broader background than most free radical researchers. My main scientific interest is nitrone and nitroxide drugs for degenerative diseases such as stroke and ischaemic injury. I hold some primary patents on these. I am especially interested in pattern hair loss, an excellent model both for age-related chronic degenerative diseases in general and for redox signaling. 1. Inzelt,G., Historical Background (or there is nothing new under the Sun), chapter 8. E. Scholtz, ed. "Conducting Polymers". Berlin-Heidelberg: Springer-Verlag; 2008: 265-269.
uric acid ascorbic acid ascorbate urate free radical antioxidant.